1963 - O'Day Mariners hull numbers 1-approx. 1300. Open cuddy cabin with "bump top", small aft deck, cabin mast support arch, small portlights, wood trim, non-self-bailing. Keel and centerboard boats. 1968 - Hull numbers approx. 1306-2200. Enclosed cabin, small aft deck removed, raised cockpit, reduced mast arch, longer portlights, quarterberths added, self-bailing cockpit. Keels and centerboards. 1972 - Hull numbers approx. 2200-3771. Streamlined cabin top with no forward hatch, widened coamings with no wood trim, mast arch removed, support post added, longer portlights. Only centerboard boats. 1980 - Rebel Industries/Spindrift Mariners hull numbers 4000-4078. Added portlights on either side of cabin, slightly updated hull and deck molds. Only centerboard boats. 1982 - Stuart Mariners hull numbers beginning at 4100, currently still in production. Back to one portlight on either side, slight updates to molds, option of both keel and centerboard boats reintroduced. During World War II, the Allied Aviation Corp. of Cockeysville, MD, manufactured laminated plywood fuselage and other sections for aircraft. With the end of the war, they attempted to make a successful transition to a peacetime economy. Allied commissioned New York designer Philip L. Rhodes to design a 19 foot laminated plywood centerboard sloop they called the "Hurricane". Though the design was excellent, it wasn't a hot seller to keep the company afloat. Toward the end they sold bare molded hulls to be finished by buyers. They soon ceased operations. Palmer Scott, a New Bedford, MA. Boat builder bought a number of the Allied shells. 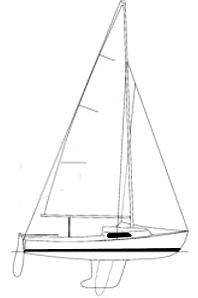 They added cuddy cabins, wooden cockpit interiors, and a cast iron keel, creating the Southern Massachusetts Yacht Racing Association (SMYRA) one design class. In 1948 it sold for $1695 complete with Ratsey sails. Marscot Plastics Co. used one of the SMYRA hulls to convert the boats to fiberglass. Later, Marscot and its associate, American Boat Building of RI, faded from the scene and the George O'Day Company took over the molds. George O'Day was one of America's most brilliant sailors, having won a Gold Medal in the Olympics. He was the first to make downwind sailing an art. The company he founded probably did more to get people involved in sailing than any other, with such boats as the 17' Daysailor. O'Day signed an agreement with Phil Rhodes to put his name onto the boat Rhodes had designed, and in 1959 fifty of the new Rhodes 19's were sold. The rig was almost an exact knock-off of the Lightning rig, with a single spreader mast and jumper struts. 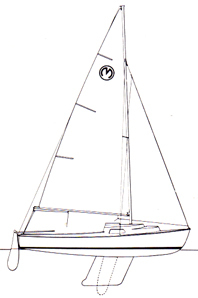 With the growing popularity of sailing as a family sport, O'Day drafted a family version of the Rhodes 19 - the Mariner. They added a good-sized cabin and redesigned the deck. The first Mariner was built in 1963 and was O'Day's first venture into the cruising market. The rig on the Mariner was switched to a simpler single spreader design. So the boat could go anywhere, a cast iron centerboard was made an option, and over the years the centerboard model became the more popular. 92 Mariners were made that first year. Interior of an early, non two plus two, style Mariner. Note window shape and fore hatch. In 1966 the National Mariner Class Association was formed and the first Notice To Mariners newsletter was distributed to Mariner owners April 15th, 1966. Al Leiman is credited as the "Father of the Class Association" with the O'Day folks being very supportive of the Association. In July 1967 Narrasketuck YC and Mariner Fleet hosted the first Mariner Class Regatta with the sailing taking place on the Great South Bay, NY. Narrasketuck YC has hosted the Mariner National Championship 10 times with the largest Nationals attendance of 39 boats taking place in 1979. In 1968 O'Day introduced the 2 + 2 model. It added 2 berths for a total of 4, a self-bailing cockpit, and extended the already large cockpit to the transom and eliminated the small rear deck. The first 2 + 2 is thought to be approximately hull # 1306. In July 1969 the very first Mariner National Championship Regatta was held on the Chesapeake Bay in the Baltimore area with 22 boats participating. Bill Finkle of New York was the first Mariner National Champion. The post-1972 2 + 2 style rounded cabin top with self bailing cockpit. This is #3627, built near the end of O'Day's production in 1979. In 1972 the cabin top "bump" and hatch opening was eliminated and the streamlined look took place and remains the current design. 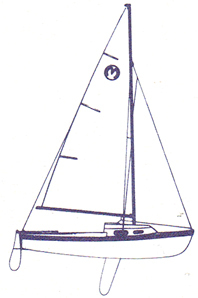 Sometime around 1974, the basic Crosby mainsheet rig of the boat was changed to mid-boom sheeting. This made more room in the cockpit for family cruising. In 1979, after producing 3771 boats, O'Day discontinued production of the Mariner to concentrate on bigger cruising boats. Also in 1979 a record fleet of 39 Mariners competed in the Mariner National Championship at Narrasketuck YC in NY and the winner was multiple Mariner National Champion Helmie Meyhoefer. During the 1979-80-time period, the Class had over 400 members. In 1980, the Mariner National Championship Regatta Most Improved Perpetual Trophy was awarded for the first time to the skipper improving the most from one Nationals to the next. The first winner was Bruce Maddock. 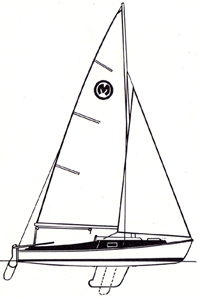 In 1980, Rebel Industries' Spindrift One Designs began production using the Mariner molds. They started with Hull No. 4000. Spindrift made a small quantity of boats, and precipitated the one big scandal of the Mariner saga. The President of Spindrift, John Barnett, brought a new factory built boat No. 4037 to race in the 1981 Mariner Nationals. He won handily, but the boat was reputed to be about 40% lighter than boats built by O'Day. After much soul searching, the Class officers retroactively revoked the measurement certificate and re-scored the Nationals results. There was a total of 78 Spindrift Mariners built. In 1982 the first minimum weight rules were established protecting the integrity of the Class. The minimum boat weight with mast, boom, rudder, tiller, centerboard and cabin enclosure boards is 1,375 pounds. In 1982, Stuart Scharaga of Sarasota, Florida became the new builder of the Mariner and Rhodes 19 as Stuart Marine Inc. located in Rockland, Maine. In 1984, David Whittier became the owner of Stuart Marine Corp. Stuart Marine exhibits the Mariner at various Boat shows including the New England boat show in February and the Annapolis Boat Show in October. The latest Stuart Mariner hull number is in the 4,200s. In the summer of 2013, Dave Whittier attended the O'Day Mariner 50th Anniversary Rendezvous celebration at Mystic Seaport, Connecticut and gave a presentation on his company and his work with the Mariner. 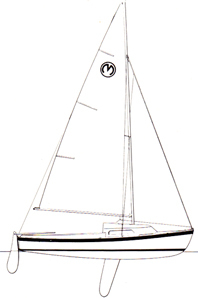 The Mariner is one of the rare sailboats created during the "classic plastic" era of the 1960s and 1970s that enjoys continued production and the availability of parts.